Freon is the trademarked name for a liquid refrigerant used in refrigerators as well as air conditioners, heat pumps and other appliances used in heating and cooling. If your refrigerator fails to keep food cold, you may think that the unit needs more Freon. Lack of Freon is unlikely, since the refrigerator maintains a consistent supply unless there is a leak in one of its components. You can perform a few tests to see if the refrigerator's conditions are due to Freon leakage or a problem with another component. 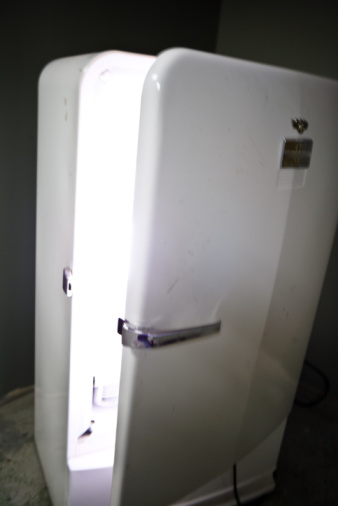 A Freon leak may cause refrigerator problems. Locate the refrigerator's condenser and place your hand next to it to sense heat. If the condenser feels cold and the refrigerator has been running, there may be a lack or absence of Freon. The problem may also be due to a defective condenser or clogged system. Unplug the refrigerator, turn the refrigerator's temperature control off and place your ear against the side of the refrigerator. Hissing and gurgling sounds indicate that Freon is present and equalizing. Silence, however, doesn't necessarily indicate a lack of Freon – there may be a problem with the condenser, fan, filter-dryer, cap tube, defroster or compressor. Remove the cover from the evaporator, located in the freezer near the evaporator fan. Plug the refrigerator back in and turn the temperature control back to your desired settings. Wait for the refrigerator to run for a few minutes with the door closed. Check the evaporator for frost. An absence of frost indicates a lack or absence of Freon or a clogged system. What Causes a Refrigerator to Be Hot to the Touch?